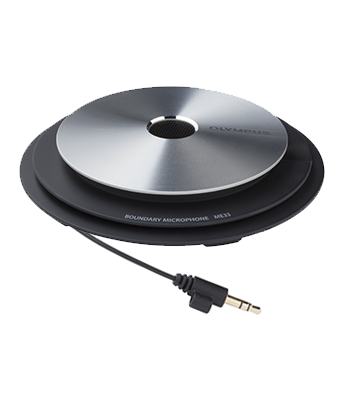 The next generation of omni-directional microphone from Olympus is here in the ME-33 boundary microphone. Paired with a professional voice recorder from Olympus, the ME-33 is the ultimate solution for clearly recording meetings, conferences and large rooms with many people. Specifically designed to clearly capture voices at a distance, the ME-33 boundary microphone automatically blocks out extremely high- and low-frequency sounds to improve sound quality and usefulness of audio clips. Connect multiple microphones to expand the ME-33’s capabilities – up to six units for stereo recording and three units for monaural recording.